For the first time ever, you can see in-game what are your chances of pulling a premium player before opening a pack on the FUT store. 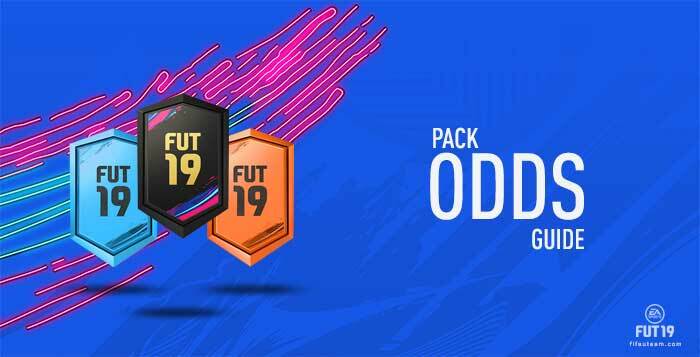 Find out the probability of any pack and how you can use FIFA 19 pack odds for your own good. Starting with FIFA 19, Electronic Arts is disclosing the odds of getting a highly-rated player in every pack available on the FUT store. In other words, pack probabilities detail the likelihood of what you get in every pack that you purchase. This is to make it more transparent when buying points on the store to purchase packs and highlights just how rare some players are in FIFA 19. EA believes that providing you with this information will help you make decisions on where you want to invest your FIFA Points, FUT Coins and time in order to build your best FUT squad. You can check for yourself the pack odds going to the store screen, highlighting the pack you wanna know and selecting ‘Show Pack Probabilities’ (space on PC; options on consoles). Because there are thousands of player items in FUT, they are categorized by item type and rating. The percentages that you see are the minimum probability of getting one or more players in the ratings range and category listed. For example, if a category and rating have a 100% probability, you’re guaranteed to receive at least one item within that category. Any probability percentages that you see are on a pack-by-pack basis and are not cumulative. That means that each pack opening is an independent event; opening multiple packs does not change the likelihood of being awarded an item from a specific category. If you flip a coin three times and get heads each time, you still have a 50% chance of getting heads if you flip the coin again. FIFA 19 Pack Odds are calculated by simulating the opening of a very large number of packs, for each pack in the Store. The number of packs opened in a simulation varies based on rarity, but it will always be enough to be statistically valid. EA then re-run this process with every content update. The Probabilities are updated regularly during the year, especially during promotions, to indicate the chances of opening higher rated players. Before buying a pack, you can see not only the probabilities of that pack but also the date the last percentage was calculated at. Some campaign specific categories, like Team of the Year, feature rare content. In some packs, the rarity of this content category may be less than 1%, and within that there will be a wide range of probabilities. Even disclosing FIFA 19 pack odds, Electronic Arts was banned from selling FIFA Points in Belgium with more countries, like Netherlands and Germany, ready to follow the same steps. As you will see later on this article, the pack probability that EA is revealing is not transparent enough. They will probably change the way how they show this information in the coming titles or they will need to use another strategy to convince gambling regulators that there is nothing wrong with FUT. Taking the pack of the above image as an example, it’s guaranteed that you would find at least one gold player when opening an Ultimate Pack. It is almost secure to say that you would also pull one or more 82+ rated players and you would have 3,4% chances to find at least one 90+ rated player there. EA have made public the probabilities of more than 20 packs and we have compiled them all in a single table. FUT Pack Odds was a great step but we would like to go further. Wouldn’t be great to know what are the chances of packing an Icon or any other player? What about knowing how much we have to spend, on average, to pull a specific card? We would also love to calculate the average return estimated value for every pack. Unfortunately, nothing of this is possible because the data provided by Electronic Arts is not good enough. Let’s look at an example to understand better why we are limited. 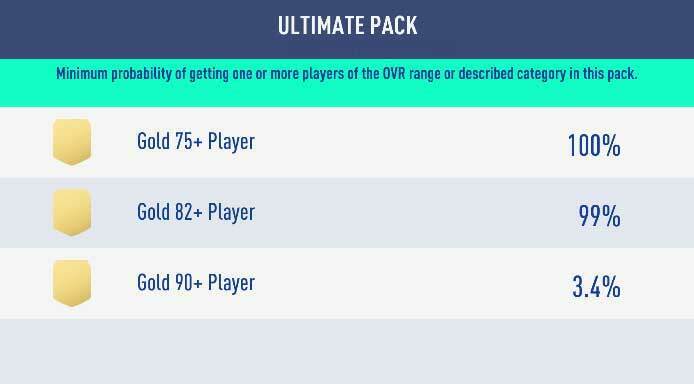 During the Ultimate Scream promotion, one of the first FIFA 19 events, Rare Players Packs were made available on the FUT store. According to the information provided on that time, there was 3,4% chances of pulling at least one Ultimate Scream player from that pack. Since we tend to focus on the average, we are tempted to say that would need to buy 30 packs in order to pack one of these cards. However, this average event probability is still fairly low. The easiest way to look at this is to consider the probability of not getting a card, which is 96.6%. We assume that we continue until we get at least one card. The probability of not getting a card with 30 packs is 96.6% ^ 30 = 35.4% which implies that you have 64.6% chance to get at least 1 card after using 30 packs. Similarly, there is 90% chance to get at least one card with 67 packs. Since we are talking about probabilities, it wouldn’t be guaranteed (the same way, you could pack it before). From here we can calculate how much you would spend in average and compare with other packs to see which one would be the best option. Sounds cool, right? Well, that’s because we are talking about special cards and EA gave us exact the odds for those cards. However, for the rest of the items we only know the odds for 75+, 82+ and 88+ rated players (see the table above, please). We have no idea of the probabilities of packing players from other ratings. In other words, we don’t know what’s inside of each pack. Let’s look at another example. We will try to calculate the chances of packing Cristiano Ronaldo NIF item from the same pack. Since there are 885 rare gold items in the game and a 50k pack features 12 rare gold players, the odds of packing him are 0,13%. Just as a reference, we used again a binomial distribution to calculate his odds: 1-(884/885)^12. In other words, you would have to buy around 75 rare players packs to pack him. Before you say it, we know that it is not true. In order to calculate these odds, we made a few assumptions but there is one that is not acceptable: card weights are different from player to player. Ronaldo is obviously rarer than the other gold players, so the probability of packing him is much lower than 0,13%. Unfortunately, we don’t know which one it is. Not just for him, but for everyone. That’s why it is not possible to calculate the odds of packing a specific player. It should include for the ones available in ‘My Packs’, and not only for promo packs. If EA is disclosing packs odds voluntarily, then they should do it for all packs and not just for the ones in which they may be accused of gambling. We need to know exactly what’s inside each pack. Using Rare Player Packs as an example, instead of 75+, 82+ and 88+, it should show 75, 76,…,87 and 88. For the pack odds lower than 1%, it should show the exact probability with a minimum of two decimal places. For example, saying that it is lower than 1% isn’t exactly the same of saying it is 0,25%. This would be the highest stage of transparency but unfortunately, EA will never do it. They don’t want to show us how low is the card weight of the most popular players and also they don’t want to tell us that they probably change it along the year and maybe according to the user profile. Until that happens, it will be almost impossible to calculate everything we want to know because there are too many factors that we don’t know. So ultimately, it takes do much packs to get a guaranteed card that I think we can simply see this as a form of gambling…I think if they were to put the number of packs required to get the desired card with 25%/50%/75%/90% probabilities, they would definitely sell far less packs! Hi. First of all, thank you very much for your kind words. Your comment was really interesting but we need your knowledge to understand how it works. We believe that we have made wrong assumptions but we need to know where exactly to correct the article. How do you calculate the 64,6% and the 90% chances? I thinks I should have been more precise – what I mean above is the probability to get at least 1 card. So the basic assumption is that the probability to get a scream card is 3.4%, and that all the card draws are independent. It should take roughly 30 packs to get 1 card – so this is the average. Now the easiest way to look at this is to consider the probability of not getting a card, which is 96.6%. We assume that we continue until we get at least one card. The probability of not getting a card with 30 packs is 96.6% ^ 30 = 35.4% which implies that you have 64.6% chance to get at least 1 card after using 30 packs. Similarly, the probability of not getting at least one card with 67 packs is 96.6% ^ 67 = 9.9% so there is 90% chance to get at least 1 card with 67 packs. Note that there is a chance to get more than one card with these examples of 30 and 67 packs – but I was more interested in the “chance” of getting nothing as I believe this probability is basically too high and decreases very slowly. I think they should consider making the first card easier to get (for each special card offering) and then the second less likely, the third one even less likely, etc. This is easy to do technically. It will probably de-incentivise people to buy regular packs but it could boost the purchase of the special packs (I mean the one with a scream/birthday/etc.). Hi. First of all, thank you. I’m not 100% sure that all card draws are independent since I never found the same two cards in a single pack. However, everything in your comment makes sense to me and I really appreciate your help. I studied Statistics at university but it was a long time ago. I have now updated the article with your brilliant support. Thank you again. Cheers.